class="page-template page-template-page-templates page-template-blog-football page-template-page-templatesblog-football-php page page-id-4259 custom-background group-blog masthead-fixed full-width singular wpb-js-composer js-comp-ver-5.7 vc_responsive"
For more than four decades, one organization has worked tirelessly behind the scenes to grow our State’s economy and develop new and exciting opportunities. One of the largest economic development organization in Nebraska, the Nebraska Diplomats, unites with other economic development organizations to promote the state's productive business climate and outstanding quality of life. 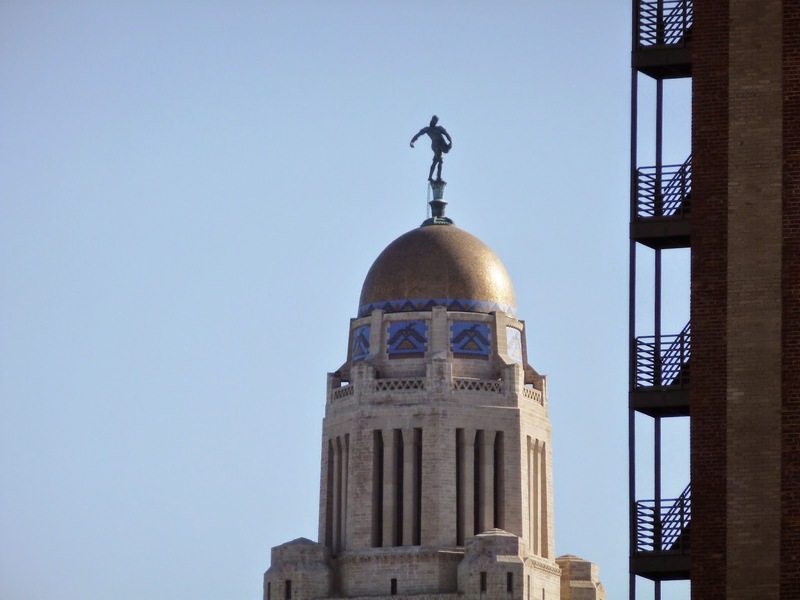 Its connection to Nebraska leaders is done without political, organizational or geographic restrictions. Through the Nebraska Diplomats program, dedicated men and women volunteer themselves and their time to build new and lasting connections with businesses throughout the state, country and world, always sharing the benefits and advantages of doing business in Nebraska. These outstanding ambassadors are helping brand Nebraska as a place to do business. Nebraska Diplomats have supported generations of business leaders from Harrison to Falls City and Haigler to Wynot, and continue to do so today. So how does it work? Each diplomat accepts the charge to support the business recruitment efforts of the Nebraska Department of Economic Development. 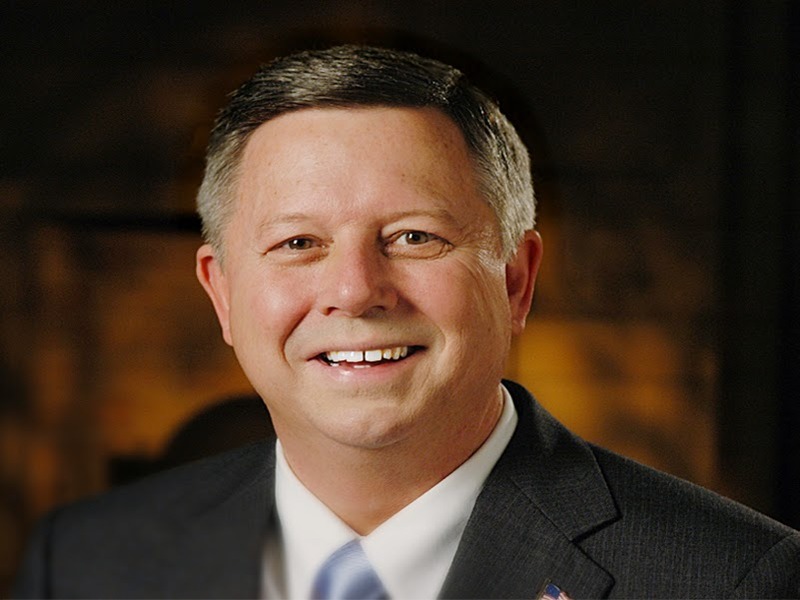 They work closely with community leaders and state officials to improve Nebraska’s business climate and competitiveness by attracting major economic projects. These invaluable connections often lead to matching executives and business leaders in a variety of industries including energy, hospitality, agriculture, manufacturing, transportation and logistics, financial, and information technology. In addition to running their own successful businesses and organizations, Nebraska Diplomats schedule personal meetings with business leaders in other states and other countries to share their firsthand experience with those interested in expanding or locating their business here. Their breadth of personal knowledge builds a sense of credibility as it relates to doing business in Nebraska. Additionally, they host events throughout the year including Business Recognition Day in the spring and the Nebraska Diplomats Passport Weekend in the fall. 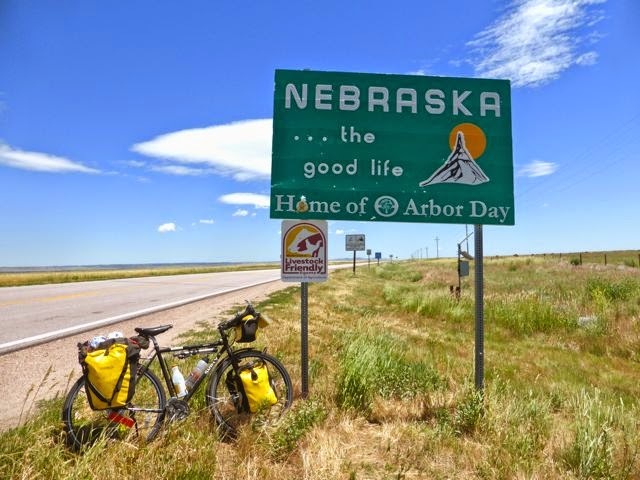 As the Passport Weekend approaches, members invite guests and prospects from throughout the United States and the world to visit Nebraska and enjoy all that we have to offer. They participate in valuable roundtable discussions with highly accomplished and successful CEOs and business consultants. They get a firsthand look at Nebraska businesses and communities through a series of personal and individualized industry tours. The weekend then culminates with a tailgate event hosted by the First Lady and myself at the Governor’s Residence, followed by a Husker game at Memorial Stadium. This annual weekend provides us with the perfect opportunity to thank those CEOs from corporate headquarters nationwide who fly and drive in for this event. Nebraska’s economy is strong, thanks to the efforts of the Nebraska Diplomats. If you are interested in becoming a Nebraska Diplomat I encourage you to contact Lori Shaal, executive director, at 402-471-4592, or lori.shaal@nebraska.gov. Residents and visitors are invited to the 2nd annual Bluffs Breeze Kite Festival at the Five Rocks Amphitheater in Gering this Labor Day weekend. This year's festival is a two-day event to be held on both Saturday and Monday. Karla Nieden-Streeks, Gering Convention and Visitors Bureau director says bring your lawn chairs, sunscreen and kites and get a good spot. Streeks says the event proved to be hugely successful last year, and they are hoping to build on that success this year. Admission to the event is free, although there will be food available for purchase, as well as kites. Demonstrations will be given, with a return this year of the giant 15 x 75 foot Rielet Kite, which is 10 feet longer than a semi-truck trailer. 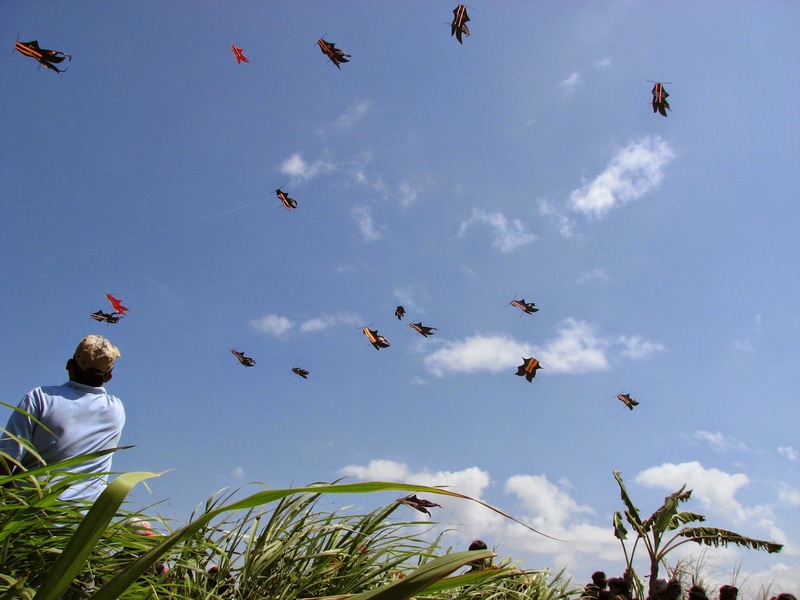 Hands-on lessons in flying kites are also scheduled. Start time will be 10 a.m. both Saturday and Monday. For the last decade, we’ve worked hard to create an environment in our state to grow jobs and today we are seeing the results. Nebraska is a leader in a diversity of industries, including the insurance, telecommunication, agriculture, food processing, transportation and manufacturing sectors of our economy. The Nebraska Advantage Act continues play a critical role in our state’s economic growth and development. This tiered incentive program was first designed to make Nebraska the go-to destination among those business owners and leaders interested in finding the right place for either starting or growing their businesses. The program was upgraded in 2013 making it easier than ever for applicants to be considered and further enhancing Nebraska’s competitive edge. That year, LB 34 made a number of changes that simplified and standardized the Nebraska Advantage Act. For those applications filed on or after September 6, 2013, the legislation: simplified the definition of taxpayer; standardized project years as calendar- instead of tax-years; authorized the Nebraska Department of Revenue to disclose project and prior benefits information to an acquiring taxpayer; and established a 180-day approval or denial application deadline. In 2013, we were in receipt of the third highest number of signed agreements under the Nebraska Advantage Act since it first took effect in January 2006. In addition, I am pleased to announce we have now received more than 450 applications representing nearly $12 billion in investment and more than 30,000 new jobs. Since the Act first took effect, there have been a number of upgrades and enhancements made, always with our number one priority in mind: Making Nebraska a key competitor for high-wage jobs and cutting-edge technology-driven industries that support and grow our free market economy. The Nebraska Advantage Act will represents our best efforts to attract key global companies and fully support and assist Nebraska companies with some of the most business-supportive incentives found anywhere in the U.S. When coupled with our solid reputation for providing dedicated, hard-working employees, excellent high-quality educational opportunities, a low cost of living including some of the most affordable housing found anywhere, low cost utilities, clean air and water, and overall safe environments in which to raise families, Nebraska is poised to remain a highly attractive and prime location for companies, and to grow and expand. The bottom line is Nebraska has good jobs, good schools, safe communities, affordable homes and an unmatched quality of life. Our goal is to make Nebraska an even better place to live, to work and to raise a family. The Nebraska Advantage is helping us achieve that goal. “Forever changed.” These simple words hold a powerful message for the cancer survivors, their support persons, and children who attend Regional West Cancer Services’ annual Camp Hope weekend. Camp Hope is offered free of charge to cancer survivors, their support persons, and their families, through funding provided by Regional West Foundation. 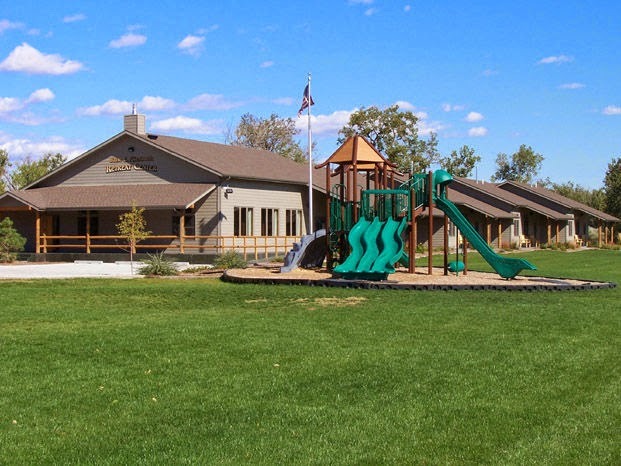 It is set in the serene surroundings of the North Platte River near Scotts Bluff National Monument at Trails West YMCA Camp in Scottsbluff, Neb. This year, the camp will be held August 22, 23, and 24. Campers can relax and benefit from the compassionate support of health care providers, family, and friends while participating in a variety of activities. Cancer survivors who would like to participate can register by calling Cancer Services at 308.630.1348. “Being around so many caring, hope‐filled, and optimistic people reminded me of something I learned long ago. There are no hopeless situations, only people who grow hopeless from lack of understanding, information, and tools,” said one former Camp Hope participant. For the past 21 years, Camp Hope has brought growth and rewards to cancer survivors, their support systems, and the professional staff who provide the program. Camp counselors include Regional West physicians, nurses, therapists, clergy, counselors, pharmacists, social workers, associates, and volunteers. Camp Hope gives cancer survivors an opportunity to explore the hopeful side of cancer while providing a vacation from everyday stress and worry. Participants attend group sessions to learn skills for coping with cancer and its after‐effects while enhancing their quality of life. The program incorporates a holistic approach by including sessions that address issues of the mind, body, and spirit. Support persons, families (including their children), and friends of cancer survivors also benefit from the Camp Hope experience. Camp Hope provides several separate programs and sessions throughout the weekend for support persons only. Recognizing that children are also affected by cancer, whether as a son, daughter, or sibling of a cancer survivor, or as cancer survivors themselves, the program also involves children in the Camp Hope experience. For more information about Camp Hope, contact Carol Diffendaffer at 308.630.1535 or email her at diffenc@rwmc.net. The facility is unsafe and deteriorating. We must provide our kids and our teachers what they need and deserve. This project is a fiscally responsible plan. This initiative is an investment in our community’s future. The Board is scheduled to meet August 25 in a special meeting at 6:00 p.m. at the SHS Boardroom to make an official decision on placement of a bond issue for the high school project on the November ballot. Matt Silverman was guest on KNEB's News Extra program Monday morning to promote the Built Ford Tough Mud Bog events at the Scotts Bluff County Fair. It will be held on Friday evening, August 8th. The cost is $10 for general admission and $15 for a pit pass. Kids under 6 will be admitted free of charge. 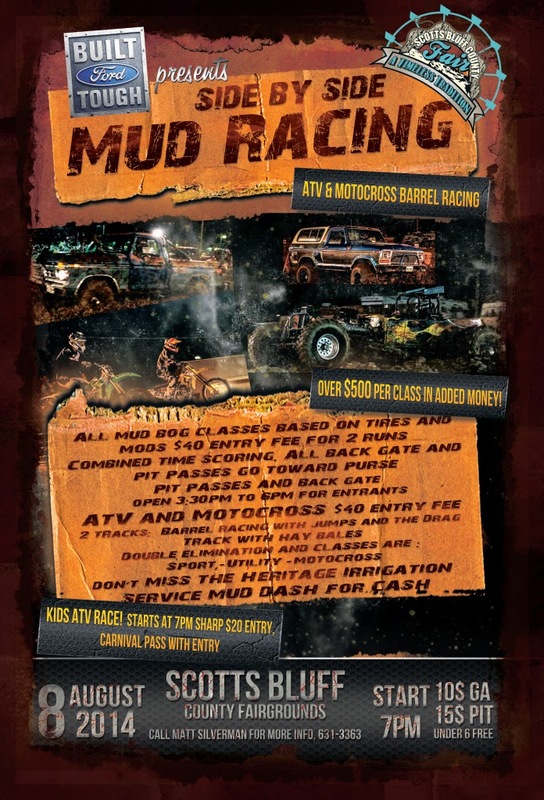 They will have Side by Side Mud racing, with ATV & Motocross Barrel Racing. There will be a kids ATV race starting at 7 p.m. sharp. For more information, contact Matt Silverman at 308.631.3363. West Nebraska Arts Center, with generous sponsorship from Kosman,Inc., is pleased to present “Impact Best” -- an art exhibit created by artists from every corner of Nebraska. The opening date is Thursday, July 31st, with a reception in the gallery from 5-7 p.m. The reception is FREE and open to the public and refreshments will be served. The show will run through Saturday, August 30th, 2014. 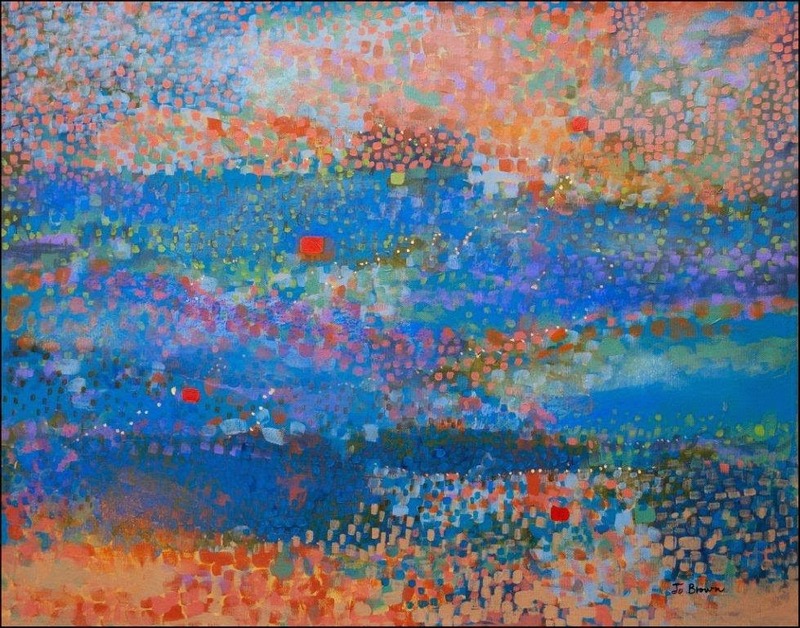 For "Impact Best" there are no rules and no limits – each distinguished artist offers his or her signature work. Impact NE Artist’s thematic shows have always inspired their artists to creative inventions. But in the privacy of their studios, throughout their careers, they have pursued a private vision, which is what Impact Best is all about. Abstract designs, horses, a quilt, a Belly Dancer, pottery, batik, metal sculptures, and landscapes painted with the wind in your face – each artist delves into his or her passion to contribute to a show that is sure please. Impact NE Artsitsis a non-profit, visual arts organization founded in 1985 with a mission to educate through outreach programs and exhibitions. Impact maintains a membership of twenty-three Nebraskans who work in a broad range of disciplines, styles, and directions, and who reside in every part of the state. Artists are elected through an independent jury. Each member is committed to four years, participating in all programs, exhibitions, and meetings. Many of the founding members continue to be a part of the organization, a testament to their level of commitment and perhaps a persuasive reason the organization continues to enjoy success. Current Impact members include Roberta Barnes,Halsey; Wava Best, North Platte; Jo Brown, Lincoln; Patricia Coslor, Sargent;Ben Darling,Sidney;Judy Greff, Ashland; Debra Joy Groesser, Ralston; Susan Hart,Cozad; Janna Harsch, Greenwood; Rick Johnson, McCook; BethJasnoch, Kearney; Howard Kaye, Lincoln; Sammy Lynn,Glenvil; JuliaNoyes,Lincoln; Sharon T. Ohmberger, Firth; Amy Sadle, Syracuse; Patty Scarborough, Geneva; Donna Schimonitz, Lincoln; Patsy Smith,Brady; Kit Watson, Chadron; Sandra K. Meyer,North Platte; Michael Montag, Omaha; and Norma Stevens, McCook. From its inception, Impact has been recognized for its record of professionalism and creative expression. Membership is limited to Nebraska artists, nationally recognized within their respective artistic disciplines. Past exhibitions have been shown in large and small venues, regionally and nationally. Impact continues a record of consistently innovative shows, which generate interest as well as provide quality educational experiences. You can view the exhibit July 31st through August 30th. NOTE: WNAC will be closed Sunday, August 31st for the holiday. Visit the gallery Tuesday - Friday from 9:00 a.m. to 5:00 p.m. and Saturday and Sunday from 1:00 to 5:00 p.m. Closed Mondays. Gallery admission is FREE and open to the public. The West Nebraska Arts Center is a cultural non-profit organization committed to education, awareness and excellence in the arts, serving the North Platte Valley Region. WNAC is located at 106 East 18thStreet in Scottsbluff, NE. To learn more visit www.thewnac.com or find us on facebook. We are blessed to live in a state with abundant water resources. However, there are times when the state experiences flooding or drought conditions. When our water resources are stressed, Nebraskans have always looked for common sense solutions. In times of drought, we look for ways to conserve our water resources and when flooding occurs neighbors come together and help each other. July 16th marked 10 years since LB962 - the Nebraska Ground Water Management and Protection Act, became law. The last decade has seen significant progress in managing our surface water and groundwater resources through an integrated management planning process. This planning process brought together local natural resources districts and the Nebraska Department of Natural Resources to work in partnership with stakeholders to develop integrated management plans. This process works to develop practical solutions to difficult water challenges. The Nebraska Department of Natural Resources and local natural resources districts work collaboratively in areas like the Upper Platte River Basin and Republican River Basin to turn what many have thought were insurmountable challenges in 2004 into great success stories in less than a decade. This collaboration illustrates that when Nebraskans work together we can solve our problems. Legislative Bill 962 also provided provisions for proactively identifying future potential conflicts so that a planning process can be put into place before more difficult water challenges emerge. This process of proactive evaluation has been significantly advanced by the Nebraska Department of Natural Resources and local natural resources districts as demonstrated by their efforts to upgrade groundwater models, data, and hydrologic tools to support future wise water management decisions. 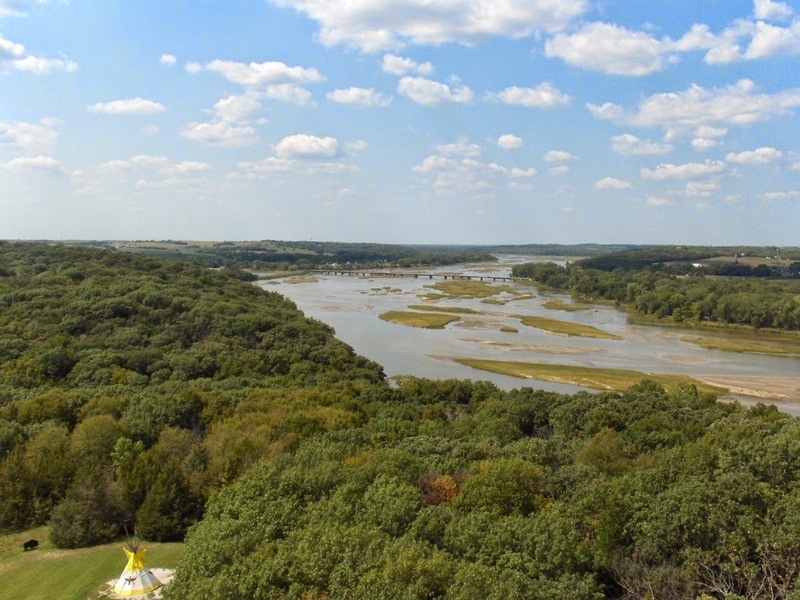 Over the past several years, modifications have been made to LB962 including provisions requiring the Nebraska Department of Natural Resources to forecast water supplies in the Republican River Basin. This forecast provides local natural resources districts a critical piece of information that they need to proactively manage the groundwater resources to address potential interstate compact shortfalls before they happen. Another important modification has been the inclusion of provisions for a voluntary integrated management planning process. To date, eight natural resources districts have chosen to voluntarily initiate the integrated management planning process. With these eight districts, in addition to the ten natural resources districts with required integrated management plans, over three-fourths of the natural resources districts within Nebraska are now participating in the integrated management planning process. 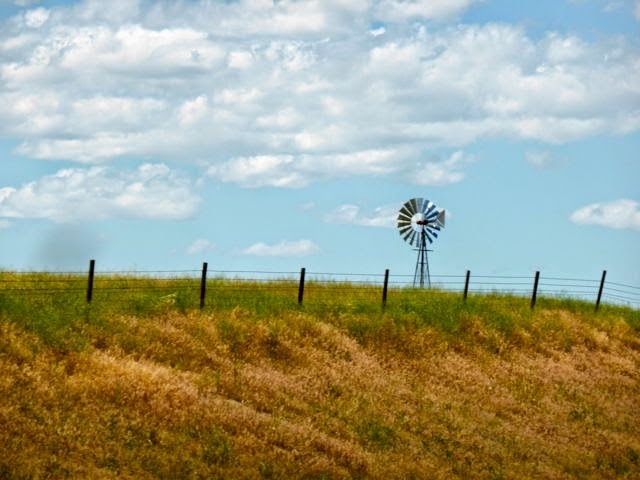 Our farmers and ranchers continue to do their part in water management through improvements in efficiencies and technologies in how water is used. Farmers continue to make significant strides in implementing new irrigation technologies such as monitoring real-time soil-water moisture and water application. Most recently, I signed LB1098 into law increasing the membership of the Natural Resources Commission and providing guidance for the governance of a new fund, the Water Sustainability Fund. I appointed eleven new Commission members representing a variety of water interests on May 15, 2014, increasing membership from 16 to 27 members. The goals of the Water Sustainability Fund are (1) to provide financial assistance to programs, projects, or activities that increase aquifer recharge, reduce aquifer depletion, and increase streamflow, (2) to protect against threats to our drinking water, (3) to provide increased water productivity and enhance water quality, and (4) to assist in continuing to meet our compliance obligations under interstate compacts and agreements. The Water Sustainability Fund was provided $21 million of state funds on July 1, 2014, and $11 million of state funds will be transferred to the fund each year thereafter. The foundation of integrated water management plans, sound science, and funding has set Nebraska on a very bright path for ensuring that our water resources will be effectively managed now and into the future. United Way "Stuff the Bus" campaign underway now! United Way of Western Nebraska invites you to help us Stuff the Bus with school supplies for children in need! United Way believes that advancing the common good means creating opportunities for a better life for all- and that begins with preparing children to succeed in school. We will be collecting new school supplies that will be distributed to eight area school districts (Scottsbluff, Gering, Mitchell, Morrill, Minatare, Bayard, Bridgeport, Banner County) and CAPWN. The supplies will then be distributed to students in need, allowing them the tools to proudly start and succeed in school. People are welcome to drop off new school supplies at the bus that will be parked at various businesses in Scottsbluff and Gering from July 21stthrough August 1st. During those dates you can also drop off school supplies in the collection containers at Mainstreet Market, Walmart, Wolf Auto, Valley Bank branch locations or the United Way office. Monetary donations will also be accepted to purchase additional school supplies and can be mailed to or dropped off at the United Way office, 1517 Broadway Suite #106, Scottsbluff NE 69361. 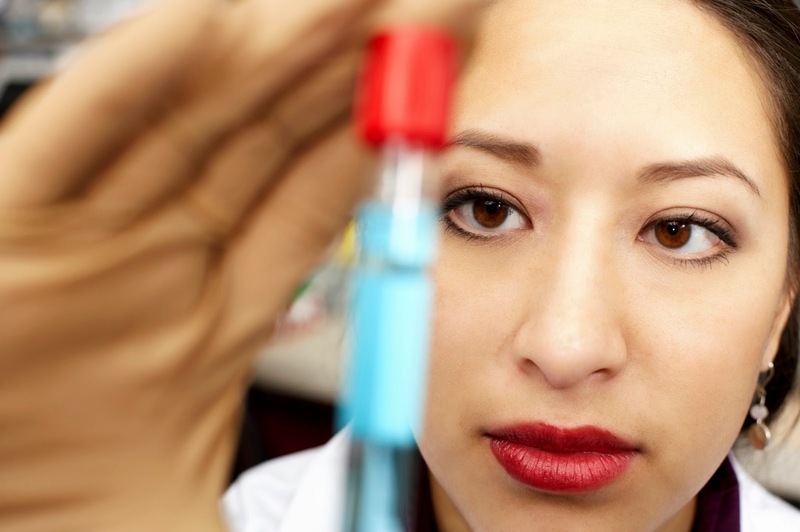 Researchers at the University of Nebraska Medical Center have received a five-year grant for $10 million to continue work on a project to fight the growing threat of methicillin-resistant Staphylococcus aureus (MRSA). MRSA, a bacterium resistant to many antibiotics, is a big problem in hospitals and can cause wound infections to more invasive diseases. In 2011, about 721,800 health-care associated infections occurred in 648,000 hospital patients, according to the U.S. Centers for Disease Control and Prevention. About 75,000 patients died during their hospitalizations. Ken Bayles, Ph.D., principal investigator of the program project grant, said he and his team are working on four projects first funded in 2009 by the National Institutes of Health National Institute of Allergy and Infectious Diseases. Projects will focus on biofilms produced by Staphylococcus aureus and understanding their role in causing infections of artificial devices. Biofilm is a natural biologic material that grows on surfaces -- like the plaque on teeth before brushing. It is estimated that the rate of infection of implanted devices is between 1 and 5 percent. He said infections happen in medical devices usually through contamination of the surgical wound. “Getting rid of biofilm associated with implanted devices is difficult because biofilm bacteria are resistant to the antibiotics used to treat infections,” Dr. Bayles said. If antibiotics don't work, the device will need to be removed, followed by extensive antibiotic treatment, and then replacement with a new device. It’s traumatic for the patient and adds a significant burden to health care costs, he said. Three of the projects will be conducted at UNMC and include Dr. Bayles, Paul Fey, Ph.D., and Tammy Kielian, Ph.D. The fourth project will be headed by Alex Horswill, Ph.D., at the University of Iowa. Dr. David Cornutt, Medical Director of the Emergency Department and Janelle Debes, Assistant Director of Volunteer Services and Guest Relations join Kevin Mooney on KNEB's News Extra program Wednesday morning to talk about a new Emergency Department volunteer program at Regional West Medical Center in Scottsbluff. The Volunteers and Friends of Regional West are pleased to introduce a new opportunity to its volunteer roster...the Emergency Department Patient Ambassador. Patient Ambassadors will welcome patients and their families to the Emergency Department, provide important information about hospital services, and serve as a valuable link between patients, their families, and the clinical staff. The Volunteers and Friends of Regional West play a vital role at Regional West Health Services. From serving as clerks in the Gift Shop to delivering patient mail, volunteers are integral to the hospital as they perform tasks that benefit both patients and visitors. Regional West boasts a volunteer staff of almost 300 volunteers who log over 30,000 donation hours a year. For the last 60 years, our volunteers have been committed to serving Regional West. For more information on volunteering at Regional West Health Services or to download an application form visit rwhs.org, or call Janelle Debes, Assistant Director of Volunteer Services and Guest Relations at 308.630.1271. Once again it is time to schedule events for the Scotts Bluff County Fair Parade, which will be held on Saturday, August 2nd with a start time at 10:30 a.m.
Brandon Ritterbush was guest on KNEB's News Extra program Tuesday morning to invite participants to get signed up to participate in the parade. The theme for this year's parade is "Adventures on the Oregon Trail." The parade will be judged, and prizes will be awarded in most categories. They are hoping to get lots of entries, with floats and bands participating in the Oregon Trail Days parade and other parades to sign up and participate. For information, call Shane Reinpold at 623-2766 or Brandon Ritterbush at 765-2722. 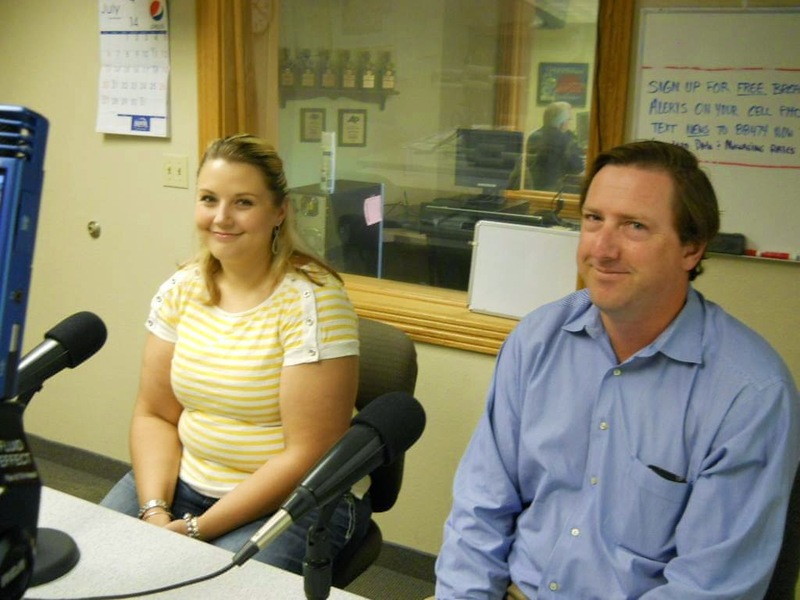 NEXT Young Professionals Krystal Aulick and Hunter Kosman join KNEB's Dennis Ernest on News Extra Tuesday morning to promote the organization's "Best of the West" Beer & Wine Tasting Festival in downtown Scottsbluff. This 4th annual event will be held on Saturday, August 23rd from 4 to 8 p.m. Cost: $20 in advance, $25 at the door. Tickets available soon at our sponsors! Food and Beverage: Beverage Tastings are unlimited, and each participant will receive a commemorative tasting cup. Multiple food vendors will also be present where water and soft drinks can be purchased in addition to food. A portion of the proceeds will be going towards Broadway Streetscape. NEXT Young Professionals would like to thank Kelly’s Liquor Cabinet and Dietrich Distributing for their efforts in partnering with NEXT Young Professionals in hosting the Festival. NEXT Young Professionals and their partners urge all of our friends participating in the festival to please act responsibly.NEXT Young Professionals Krystal Aulick and Hunter Kosman join KNEB's Dennis Ernest on News Extra Tuesday morning to promote the organization's "Best of the West" Beer & Wine Tasting Festival in downtown Scottsbluff. This 3rd annual event will be held on Saturday, August 17th from 4 to 8 p.m. at 18th and Broadway. Cost: $20 in advance, $25 at the door. Tickets can be purchased at The Spa by TLC or Valley Bank and Trust locations in Scottsbluff and Gering. You can also buy tickets from any NEXT Young Professionals Board member, or at the event. A portion of the proceeds will be going towards Downtown Revitalization. NEXT Young Professionals and their partners urge all of our friends participating in the festival to please act responsibly. 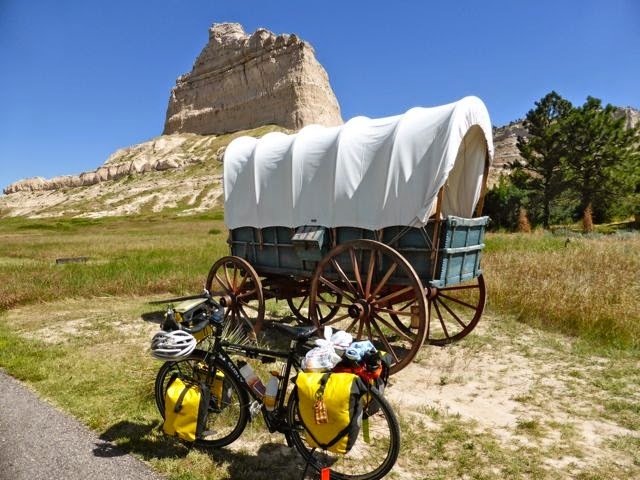 Please enjoy this blog post a lady wrote about her visit to Scottsbluff! I’d been spoiled. For the last 3 weeks I had a string of hosts, all the way from Moab, Utah to Cheyenne, Wyoming, with the exceptions of one night when I camped with a random family at the Great Sand Dunes National Park. You could say I was a bit out of practice when it came to free camping when I rolled into Scottsbluff, Nebraska this past Sunday. I was also out of fuel. 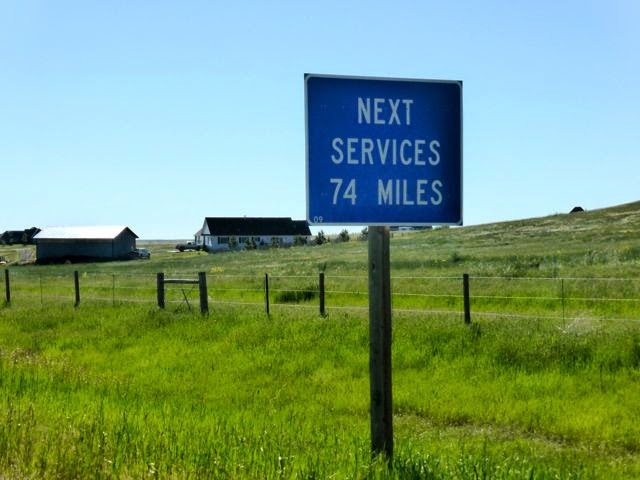 I crossed the border from Cheyenne, Wyoming and had no services on the road for 105 miles to Scottsbluff, Nebraska. Yes,……Nebraska!!! What am I doing here? It wasn’t on my original itinerary for the states, but since it was just a slight detour heading north to Mt. Rushmore, I decided to ride through corn country. There were no restaurants, no grocery stores,….not even a gas station on the road. Do these people eat? Don’t they drink coffee or need gas? That was my initial impression of the corn huskers. I saw countless churches, but of course none of them sold food. I would have killed for a bake sale out front, but the only thing baking on this Sunday was me! At 100F, the Nebraska sun beat down on me all day. I couldn’t even think straight when I arrived in Scottsbluff and needed to take care of my immediate needs: food and water. I rolled up to a Subway. I could kill two birds with one stone, nourishment and free wireless. Most people don’t know if but Subway sandwiches has great wireless, better than McDonald’s and the food is a step up. 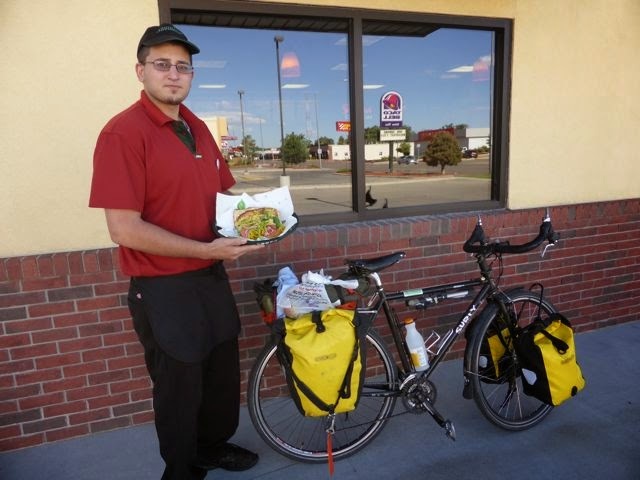 The first Nebraskan I interacted with was Travis, who worked at Subway. He hooked me up with a free meal and I chilled out in the air conditioned environment, taking refuge from the heat, entertained with trip planning and blogging. What should have been an hour break turned into an entire evening. 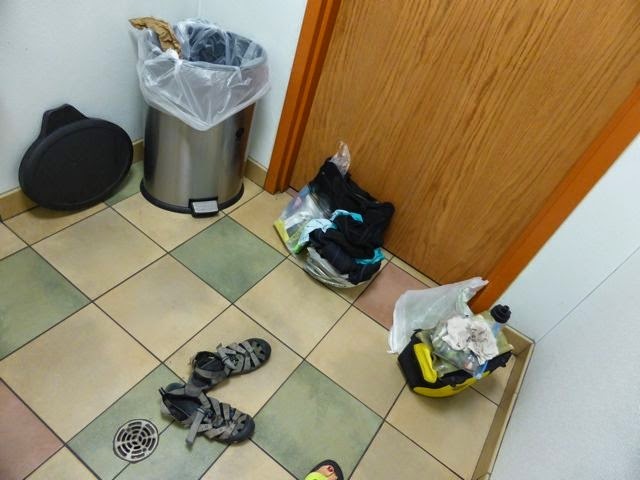 I knew I needed to find a spot to camp in town, so an hour before they closed, I finally left Subway, not without a luxurious sponge bath in their bathroom. Another reason I love subway. Unlike McDonald’s, they have private restrooms that you can lock and use for a good 10 to 15 minutes while bathing! I left, headed to the local park when I saw an ambulance pull in the Taco Bell parking lot next door. It triggered a thought,…..I used to camp at fire stations. I had forgotten all about this option. I could ask these paramedics where the fire station in Scottsbluff was and what it was like. I parked outside Taco Bell and in I went. The poor paramedics, were trying to enjoy a quick dinner break and here I was pestering them. Unfortunately they didn’t recommend sleeping there as it was adjoined to the police station and they got a lot of calls throughout the night. However, they told me I could camp at their service center on the outskirts of town in a more quiet location. I accepted of course! Jordan and Dan were working the night shift along with Megan. They were the only ones back at the station. 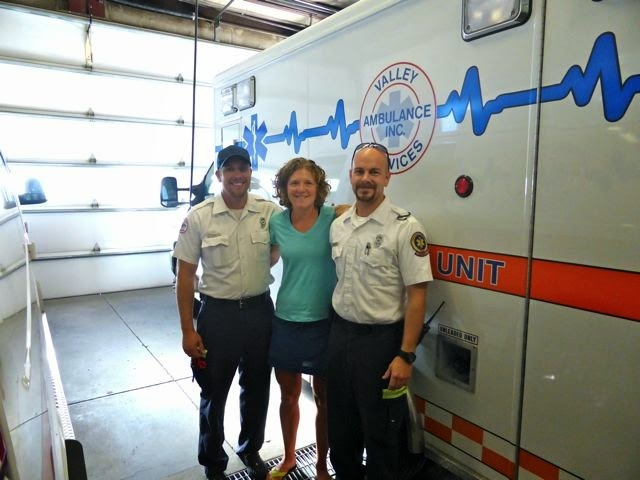 Jordan, the owner’s son, gave me an a tour of the building and the low down on how the paramedics dispatching works. We talked about my travels, the area, and where I was headed next. Jordan sent out a few messages to friends to see if he could find me a host for the next night. I could have chatted with the guys all night but they needed as much sleep as possible if they average 2 or 3 calls a night, and I was pretty whipped after my long day. They wouldn’t have anything of me pitching my tent and instead offered me a bed inside a motor home that wasn’t being used, parked in the garage. You know me, I can’t say no to a motor home…..
Dan and Jordan look fresher than me, and they attended 3 calls during the night. I just slept after riding 105 miles. I probably could have slept for a day inside the camper without any noise or natural light to wake me up, but I did set my alarm so that I could say goodbye and thanks you to Jordan and Dan at the end of their shift. Jordan already had a host for me by the time I woke up in the small town of Crawford where I was headed that evening, 75 miles away. I hit the road and headed to Scottsbluff’s national monument. You can’t pass through Scottsbluff without seeing their pride and joy, and to tell you the truth, the bluff really is a unique landmark. 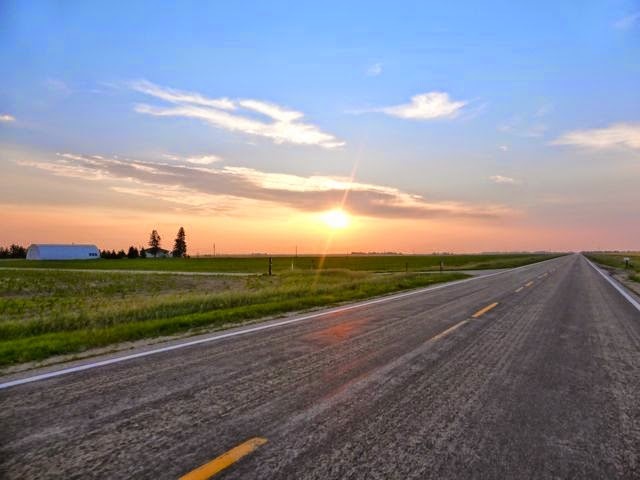 My mental image of Nebraska was flat farmland filled with cornfield, but after cycling the western portion of the state, I have yet to see a flat stretch that last for longer than 100 yards. In the western part of the state, there are bluffs galore. I didn’t know exactly what a bluff is, but now that I have seen them all around western Nebraska, I recognize this rock and land formation as something I started seeing back in Utah. Scottsbluff is an interesting town historically because it is right on the Oregon Trail and as the name of the town indicates, there are bluffs all around. 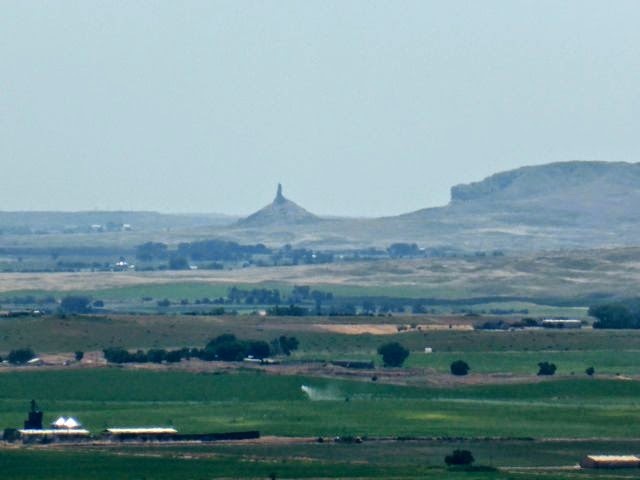 Pioneers headed out west on The Oregon Trail could see the bluff and Nebraska’s Chimney Rock, another icon on the outskirts of Scottsbluff from hundreds of miles away on their journey. I imagine when they arrived at the bluffs, they were so taken back and amazed by these unique landforms, it kept them curious and trekking further in west, in hopes of discovering more beautiful sights. Born and raised in Oregon, although my ancestors didn’t take the Oregon trail, I think of myself somewhat as a pioneer, creating my own trail across the world, leading to Oregon. At the monument, I got a few pictures of the covered wagons and bluffs, but I wasn’t going to ride to the top because it was getting late and I didn’t have the desire to climb. However, they had a shuttle bus that would take me to the top, so I opted for this. At all the other national parks, the shuttle bus is monstrous and transports dozens of tourist. Here, at the monument, the shuttle bus was a mini-van, more like a private chauffeur. I finally said goodbye to Doug and started pedaling north. Again, not a flat bit of terrain to be found as I crossed bluff after bluff with a headwind that blew relentlessly at about 30mph. I hate to disappoint my hosts, but making it to Crawford, 75 miles away was going to be impossible! I was considering my options when road construction stopped me. The car at the front of the line was switching drivers and the nice woman got out and started to talk to me about my trip. I told her my predicament and she agreed that my destination for the night was going to be a bit too ambitious with the wind, which was blowing harder than normal for the area. Luckily, she lived in a town just up the road, and told me they’d love to have me stay with she and her husband. How lucky am I? I seem to find hosts in all the right places. I didn’t want, Jill, Jordan’s friend to worry or be waiting for me, so I asked Nancy if she would kindly call her and explain the situation. It took me a good couple of hours from the road construction to reach Ed and Nancy’s house, but I finally arrived. She told me Jill was really disappointed I didn’t make it, but understood with the weather conditions. Jill was planning on taking me to the old historical army base in the area and introducing me to Iris Paris, the daughter of the first woman to cycle across the country in 1948, who happened to live in her town. What’s are my chances that the day before, I didn’t have one friend or host in Nebraska, and now I had so many I couldn’t stay with them all! It also was incredible, that one of these hosts lived in a small town in Nebraska where Norma Jean Belloff set of to cycle cross-country in 1948 and became the first woman to do so in history! 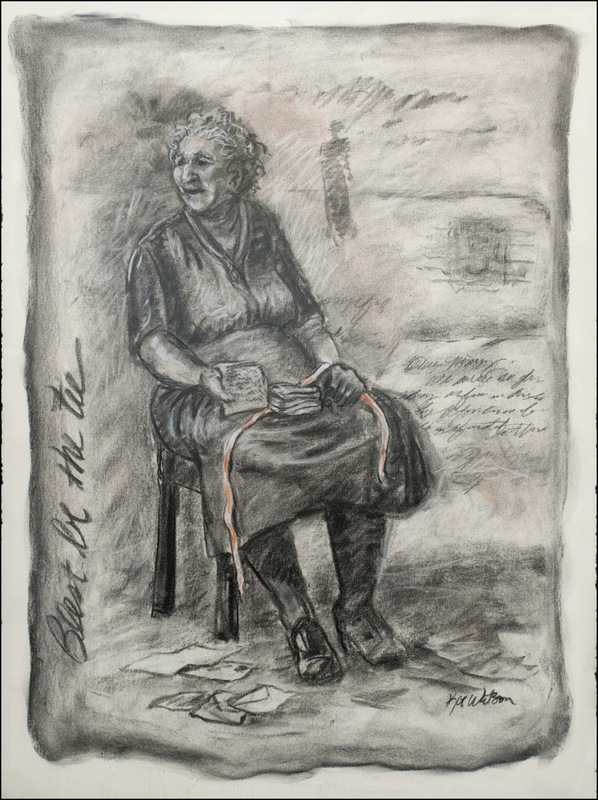 Iris Paris, still lives in the area and wrote a book about her mom, entitled “Once Upon A Chariot: A True Story About Norma Jean Belloff, Who Established the USA Woman’s Record for Cross Country Bicycling in 1948”. I ended up having a lovely stay with Nancy and Ed. Nancy was a cyclist herself and the retired PE teacher at the school in town. After dinner Ed helped me a bit with my bike and in the morning, the two saw me off at 5:30 am, an early start to beat the wind (unfortunately that was wishful thinking). Jill, who I wasn’t able to meet is sending me the book which will be awaiting my arrival in Oregon. Something tells me however, that I’ll be back to Scottsbluff, Nebraska and have the opportunity to meet Jill and Iris Paris personally. You see, at the top of the monument, Doug pointed out the hiking trail up, that he hikes, by saying, “Now Melissa, I know you’ll never be back here, so I want to show you this…….” Doug, yikes, you NEVER say the world never to me!!!! We all know what that means in my life…… Something tells me I’ll be back to Scottsbluff. I’m not sure exactly why, but this isn’t the last time I will visit this town in western Nebraska. Susan Wiedeman and Larry Hubbard join Kevin Mooney on KNEB's News Extra program Wednesday morning to talk about a fun event their church is holding this Sunday. Plymouth Congregational Church in Scottsbluff will have their annual "Ice Cream Social" this Sunday, July 6th from 2 to 4 p.m. The cost is just $2. Patriotic music will be performed by the Gering City Band. Plymouth Congregational Church is located at 743 Wintercreek Drive in Scottsbluff. NORFOLK, Va. – A 1999 Hershey High School and 2010 Park University graduate and Scottsbluff, Neb. native is serving on one of the world’s largest warships, the U.S. Navy aircraft carrier USS Harry S. Truman (CVN 75). 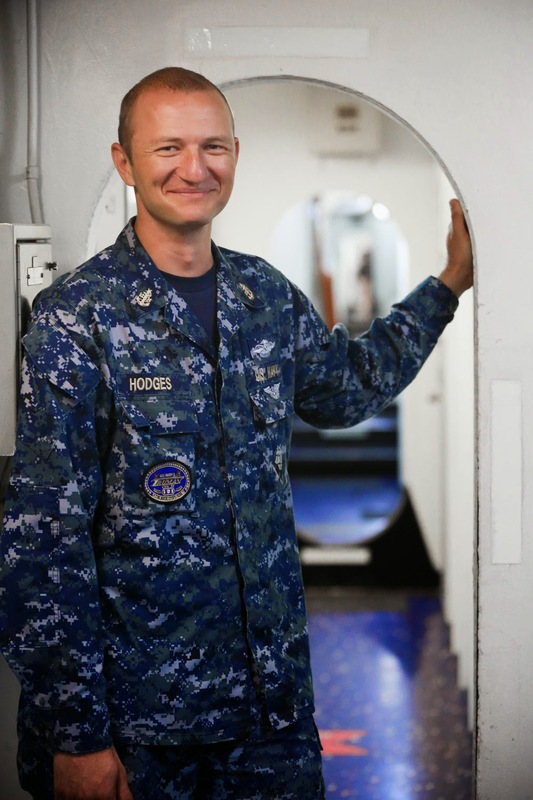 Senior Chief Petty Officer Ben Hodges is a hospital corpsman aboard the Norfolk-based ship, a Nimitz-class nuclear-powered aircraft carrier and one of only ten operational aircraft carriers in the Navy today. 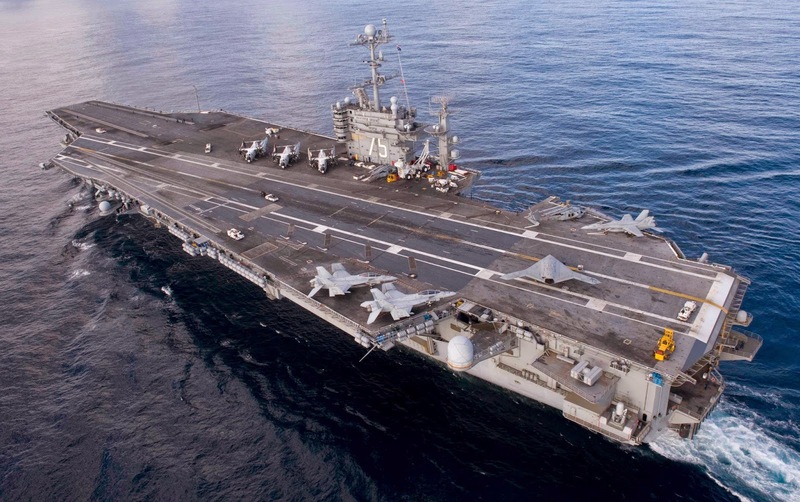 Named in honor of former President Harry Truman, the carrier is longer than 3 football fields, at nearly 1,100 feet long. The ship is 252 feet wide and weighs more than 100,000 tons. Two nuclear reactors can push the ship through the water at more than 30 mph. Sailors’ jobs are highly varied aboard USS Harry S. Truman. Approximately 3,000 men and women make up the ship’s company, which keeps all parts of the aircraft carrier running smoothly — this includes everything from washing dishes and preparing meals to handling weaponry and maintaining the nuclear reactors. Another 2,500 or so form the air wing, the people who actually fly and maintain the aircraft. USS Harry S. Truman, like each of the Navy’s aircraft carriers, is designed for a 50-year service life. When the air wing is embarked, the ship carries more than 60 attack jets, helicopters and other aircraft, all of which take off from and land aboard the carrier at sea. Powerful catapults slingshot the aircraft off the bow of the ship. The planes land aboard the carrier by snagging a steel cable with an arresting hook that protrudes from the rear of the aircraft. All of this makes the Harry S. Truman a self-contained mobile airport and strike platform, and often the first response to a global crisis because of a carrier’s ability to operate freely in international waters anywhere on the world’s oceans. As a member of one of the U.S. Navy’s most relied upon assets, Hodges and other USS Harry S. Truman sailors know they are part of a legacy that will last beyond their lifetimes. Regional West Foundation Board members Mary Kay Haun and John Massey join Kevin Mooney on KNEB's News Extra program Wednesday morning to promote the annual Thelma Jones Memorial Golf Scramble. This year it will be held on Monday, July 14th from 8 a.m. to 1 p.m. at the Scottsbluff Country Club. For more than two decades, on the second Monday in July, golfers, volunteers and community sponsors gather at the Scotts Bluff Country Club for the annual Regional West Foundation Thelma Jones Memorial Golf Scramble. Proceeds from this tournament, named in honor of a longtime friend of Regional West who died of cancer in 1989, help support Prairie Haven Hospice and the Cancer Treatment Center at Regional West. Individuals and/or teams may register to play and sponsorship opportunities are available. Coffee & breakfast burritos in the morning. Lunch included....Credit Management's famous hot dogs or box lunch. A dinner and awards ceremony follows the tournament included for all participants. Great prizes with flag and team prizes awarded in both of two sessions. Prizes will be paid to six teams plus a women's team. For information or to register, contact Shelly Knutson at 308.630.2244. Deb Carlson, Children's Librarian at the Lied Scottsbluff Public Library joins Kevin Mooney on KNEB's News Extra program Monday morning to promote the library's Children's Summer Reading Program. The Lied Scottsbluff Public Library is inviting area children to participate in the 2014 FIZZ, BOOM, READ! summer program. Boys and girls may register on Tuesday, June 3rd anytime between 9:00 a.m. and 5:00 p.m. at the library. The program is for children from infants through the sixth grade. Registration will continue throughout the summer for those unable to sign up on June 3rd. Weekly events kicked off in the Library Park Monday, June 9, with a science demonstration from the Edgerton Explorit Center in Aurora, NE. Other programs will include a movie party at the Midwest Theater, a Mad About Science morning at the library park, natural science fun at the Riverside Discovery Center and a Lego Club building event. Children who read 20 books can choose between two dates for the Splash Bash pool party at the Westmoor Pool. The library will also show cartoons and short films on Thursday mornings at 10 a.m. in the library meeting room. Although everyone is invited to come to the weekly programs, attendance is not required and readers can return books they have read and receive credit during regular library hours. The reading program will conclude with a Magic Show & Big-Bang Wrap-Up Celebration at the Midwest Theater on Tuesday evening, July 22. Geoffrey Thompson, an award-winning magician from Cheyenne, WY, will present a magic show which will be a blast for the whole family. Following the show, prize winners for summer activities will be drawn and every child will get a science souvenir of the FIZZ, BOOM, READ! Summer Reading Program. No reading requirement is necessary, admission is free and the community is invited to attend. For more information, pick up a calendar of events or call the Lied Scottsbluff Public Library at 630-6250. 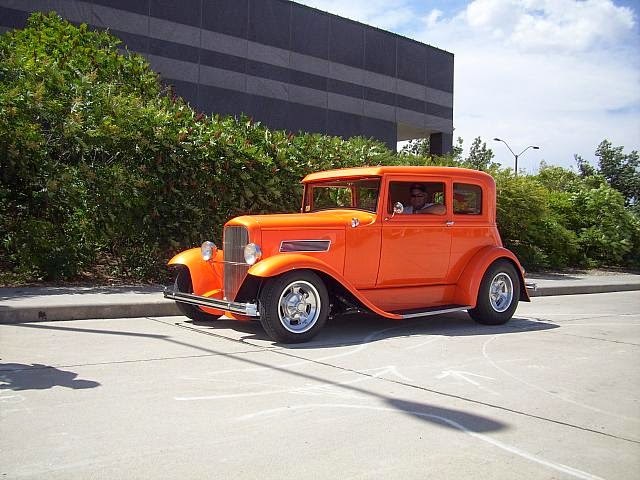 It's time for the 2014 High Plains Auto Club "Rock 'N Roll Father's Day Classic Car Show! Held annually in conjunction with the city of Gering's Five Rocks Amphitheater Located ½ mile South of the intersection of Highways 71 & 92 in Gering. This year the show will be held June 13th-14th, 2014. Pictures will be taken Friday night and Saturday AM for our slide show presentation! You’re gonna’ love the show! Each entrant will be issued 2Friday BBQ meals and 2Saturday Banquet meals upon arrival. For information email jscspencer@gmail.com or visit www.highplainsautoclub.com. Harrison, NE: On Friday, May 30 there will be a talk given by a ranger from Agate Fossil Beds National Monumentin front of the Sutler’s Store at Fort RobinsonState park. This talk “Wildflowers are My Friends” will start at 7:00 pm. NE Wildflower Week runs from May 31 through June 8 this year and with the rains the area has received there should be a good variety of wildflowers to enjoy. Agate Fossil Beds National Monument is located just 22 miles south of Harrison, or 34 miles north of Mitchell, Nebraska, on State Highway 29, then east on River Road for three miles to the visitor center,open from 9 a.m. till 5 p.m. with the trails open from dawn till dusk. Agate Fossil Beds is a free park. 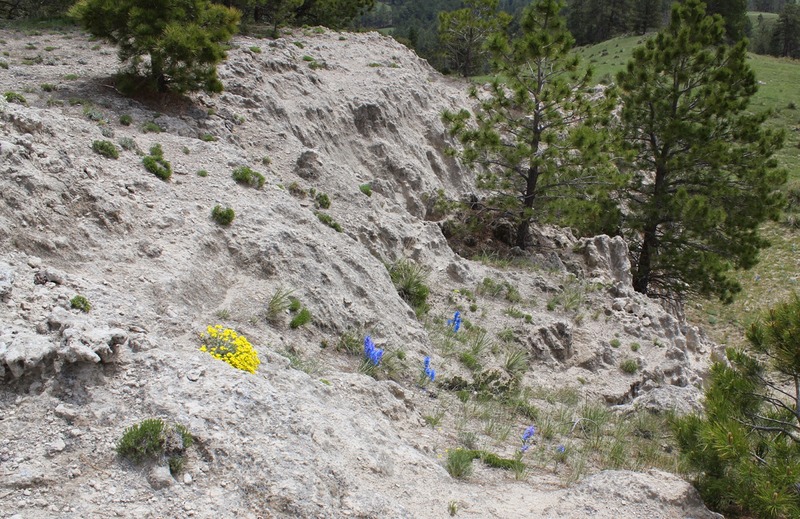 For more information about scheduled events, go to www.nps.gov/agfoor visit Agate Fossil Beds on Facebook. 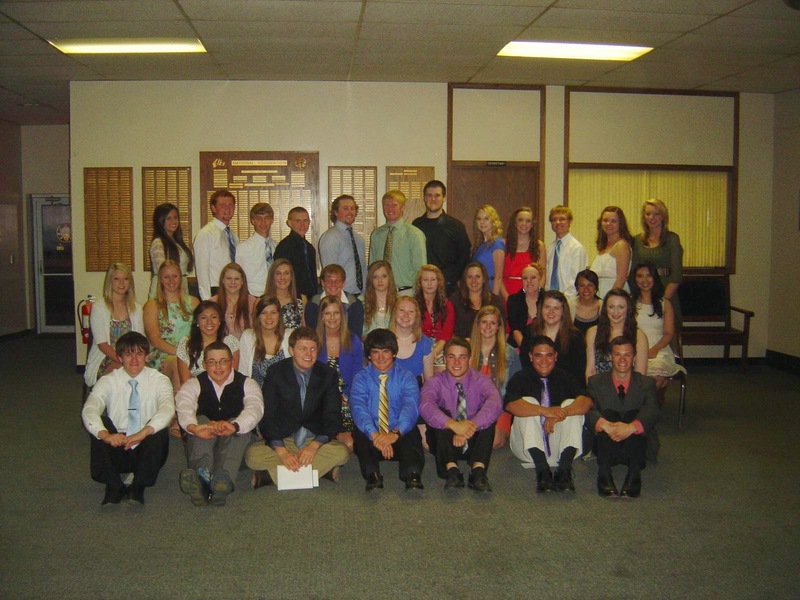 The Scottsbluff Elks Lodge hosted over 180 students, parents, and teachers on Tuesday night, May 6th, to present this year's scholarships. The students were from throughout the Panhandle. Over $46,000.00 was awarded to help these young adults to start their college careers and receive the degrees to carry them into the future with good jobs. It was suggested by Dr. Guy Wylie, the Scholarship Committee Chairman, "When you have your degree and have worked, and are ready to start a family, come back to Western Nebraska. There is no place better to raise your children than in a safe and nurturing environment. Unlike the big cities with all of the crowds, traffic, and pollution you can feel safe for yourselves and your family in a community with high values and friendly people." The guest speaker for this year's banquet was veterinarian Dr. Jerry J. Upp, a graduate of Gering High School, who in 1983 received a scholarship from the Elks which provided him with his degree. Dr. Upp's father, an active Elk and contributor to the Elks National Foundation, died when Jerry was in the 8th grade. Jerry was contacted during his senior year by Jim Miller, a friend of his father who was also an Elk. Jim told him to apply for a scholarship designated for children of Elks and Elks Foundation contributors. It was this scholarship that saw him through his undergraduate degree and started him on his path to his current career and he expressed his gratitude to Jim and for the Foundation. In addition to receiving scholarships, which are awarded by the local Lodge, the highest scoring applications are forwarded for judging on the State and National levels which can lead to a $50,000.00 scholarship. All current juniors in high school are encouraged to start considering the application process for the many different scholarship categories offered by the Elks. Applications and instructions can be found with your high school advisers or online. Gering Police Investigator Henry Moreno joins Kevin Mooney on KNEB's News Extra program Monday morning. CAPstone's 5th annual Superhero Run will be held on Saturday, May 17th with check-in at 8 a.m. at the CAPstone Office at 900 P Street in Gering. The race begins at the CAPstone Office and ends at the Gering Junior High Stadium. 1K Kids Fun Run begins at 9 a.m.
5k Walk/Run begins at 9:30 a.m.
A costume contest will be held at the completion of the race. This year, CAPstone is sponsoring a Team Challenge - teams of 5 members - total times will be tallied and averaged to determine the winning team. For information, call 308.632.7274, email admin@capstonenebraska.com or log on to www.capstonenebraska.com. Sugar Valley Rally Organizer and Founder Dan Dickinson was guest on KNEB's News Extra program Monday morning to promote the 2014 Sugar Valley Rally. Cars on display until . . . The above listed schedule will change as the route is perfected and stops etc are arranged. For information: sugarvalleyrally.com. Or email: sugarvalleyrally@gmail.com. Or call 308-632-3381. Keep Scottsbluff Gering Beautiful's Kathy Kropuenske and Panhandle Coop's Susan Wiedeman were guests on KNEB's News Extra program Tuesday morning. The 2014 Earth Day Celebration will take place in the Main Street Market parking lot in Scottsbluff on Saturday, April 12th. They will be giving away cloth bags when you bring in a bag full of plastic bags starting at 10 a.m. Trees will be given away by NPNRD starting at 10 a.m. Household Battery Collection by the Customer Service Booth inside the store. Platte Valley Bank - Document Shredding starting at 10 a.m.
KNEB-FM Live Remote from 10 a.m. until noon. Recyclables including cardboard, aluminum, plastics, magazines and newspapers by Environmental Services City of Scottsbluff. Used Oil & Antifreeze Collection by the City of Gering. SCOTTSBLUFF, Neb., – The wall of plastic enclosing part of the second floor lobby at Regional West Medical Center is the first sign that something new is happening at the hospital. Workers have been steadily moving I-beams and construction materials through an opening in the outer wall of the main entrance since the first of the year, as work begins on a new education center. For many, it’s the first sign of the major fundraising campaign launched more than two years ago by Regional West Foundation to support important improvements at the Medical Center. “Our goal is to raise $4.2 million over five years to fund investments in technology, expand health care services, provide space for on-site education for health care providers, and support the Medical Center’s renewal project. I’m very pleased to announce that we have successfully raised almost two-thirds of our goal,” said Regional West Foundation President John Massey. Oregon Trail Community Foundation President Travis Hiner said their board was unanimously in favor of pledging $45,000 to the campaign. 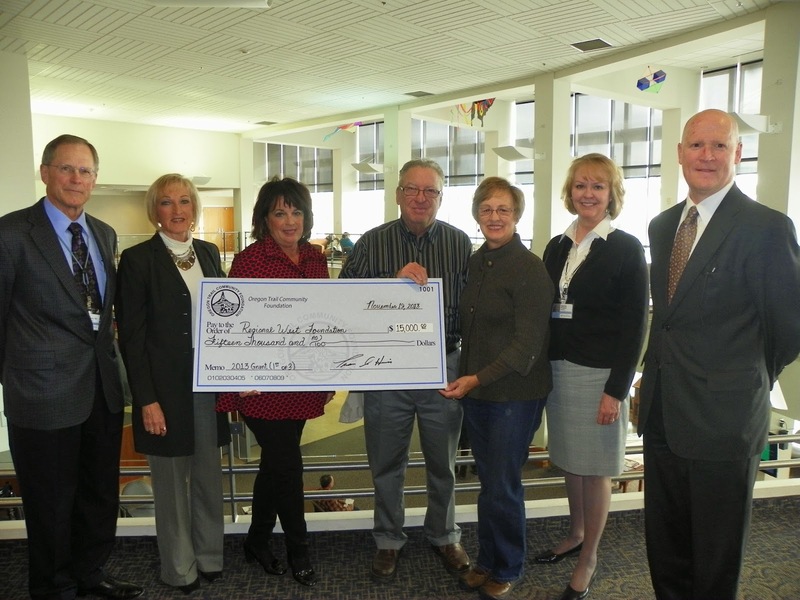 “Regional West Medical Center is a vital force in our community. 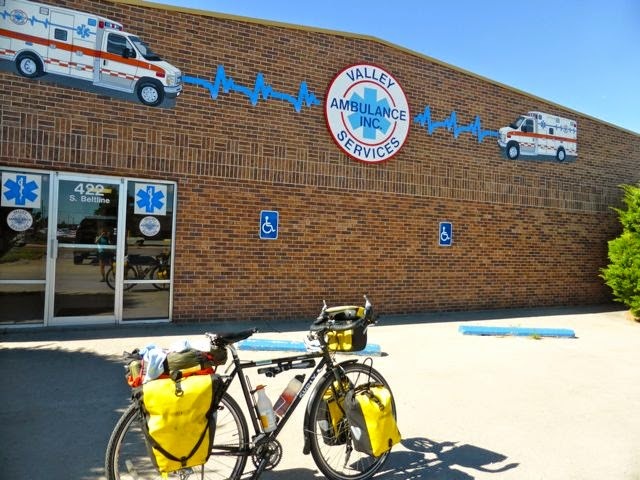 It provides health care and careers for our family and friends, and is a mainstay of our regional economy,” said Hiner. In addition to other substantial pledges, funds raised at the 2013 Regional West Foundation Gala were donated to the Campaign for Continuing Excellence. Now, Regional West Foundation is kicking off a community campaign in an effort to meet or exceed their goal. This will be the Foundation’s first major fundraising campaign since its 1995 campaign to raise funds for the Regional Communications Network. Projects designated for funding through the Campaign for Continuing Excellence include development of a new education center, which is being constructed adjacent to the Medical Center’s second floor lobby. It will feature the latest audio-visual and communications technology and provide on-site meeting space for more than 250 people. “The education center will provide the room and technology to allow our staff to access continuing education on-site, rather than traveling to attend conferences and courses,” said Shelley Knutson, executive director of Regional West Foundation. In addition, renovation on 2 West patient care unit will soon be underway as part of the Medical Center’s “Renewal Project.” The Foundation has committed $600,000 for the renovation which will include complete demolition and new construction of approximately 24 patient rooms and adjacent hallways. The campaign will also fund the purchase and installation of a large-bore CT simulator at the Cancer Treatment Center as well as new cardiac catheterization equipment in the Heart Center.